Last night we ordered sushi from our favorite Japanese restaurant. Mmmm–avocado rolls, asparagus rolls, and vegetable rolls. Sushi, even sushi made only with vegetables, is ridiculously expensive, so I try to keep costs down by ordering less and making side dishes at home. Normally I make miso soup and edamame, but last night I decided to make a couple of salads. Grated fresh ginger or even ginger powder will also work in this recipe, and you can add more water as needed. 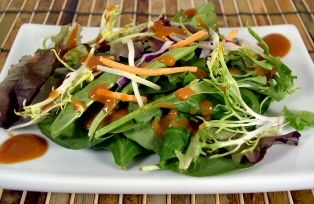 Warning: it’s a very concentrated dressing, so just drizzle it over your salad. 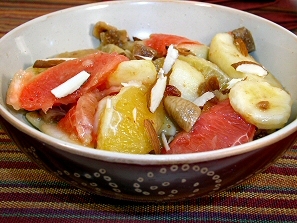 Combine the apples, oranges, grapefruit, figs, and banana. (Note: be sure to cut the little stems off the figs first.) Put the lemon juice, water, and dates into the blender, and blend until liquefied. Pour over the top of the fruit and toss to coat. Cover and chill for at least 2 hours. Shortly before serving, sprinkle with the almonds. If your fruit isn’t very sweet, you may add a little agave nectar or other sweetener, but I liked it just this way. Hi Susan, I’m drooling here looking at the ingredients for the sesame miso ginger dressing, but living in semi rural Ireland it’s a challenge to find some of the items on the list. My local health food shop seems to stock brown rice miso or barley miso. Are either a suitable substitute for red miso? Also just wanted to say that I’m so happy to have found your website. I’m not fully vegan, and not looking for entirely fat free, but I’m totally inspired by your recipes and it’s just wonderful to find such an array of ideas for beans, lentils and grains. Thanks! Thanks for your kind words, Rita! I think that either of those misos will work, and they will probably be less assertive than the red miso, which means that you can play with the amount a little until you like the taste. I hope you enjoy it!